​Little-fatdog is the new trend among pet owners and it has taken the formula of low-fat formulas with fewer calories for weight loss. It looks like pet owners have learned a thing or two from fitness aspirers who have taken body health to a completely new level. The same way you can go out to find high-quality protein, calorie or fiber formula, now you can also find a number of dog food options that have slightly lower fat content that fits the needs of your pet. However, it is not easy to find the best low-fat high-quality dog food. In most cases, you have to rummage through many brands of low-fat dog food to find one that is ideal for your pet’s needs. How hard can it be to find low-fat food for my pet? Well, there are other dynamics at play. For instance, when pet food companies manufacture low-fat dog food, they lower fat content by decreasing meat content. This is not ideal dog food because meat is an important part of your pet’s diet. The good news is that you can still find low-fat dog food that has the right nutrient levels. We looked around and came up with a list of best low-fat dog food as well as when and why your pet might need it. The easiest way to find out the amount of fat in any brand of dog food is by reading the labels. The trick here is to shop for dog food the same way you would shop for your own. For starters, ensure the ingredients come from quality sources. For instance, if the main ingredient is protein, a good source would be a meat meal or whole meat. However, your pet also needs other nutrients such as carbs. If a dog food label says its carbs come from wholesome sources like oat, brown rice, or even sweet potatoes, go with that brand. However, if your pet does not like grains, brands with sweet potatoes are the best option. No dog food is complete without omega acids. Brands with flax or fish have an abundant supply of omega acids. Also, if there is veg and fruit in there the better because they are the main sources of dietary fiber, which is good for digestion and bowel movement. Mostly, when your pet is placed on low-fat dog food, it’s because she is going through some medical situation that requires him to lose or stay away from body fat. Generally, fat is not bad for your petand most of the pet foods in the market have fat from good quality sources like omega acids. However, some pets develop medical conditions that require them to consume low amounts of fat or none at all. Here are a few reasons why your pet might need low-fat dog food. Some pets can’t stand certain types of dog food. In fact, if your pet is one of those with a sensitive stomach, you will know. Pets with a sensitive stomach tend to make a mess regularly. Nevertheless, there are steps you can take to help a dog with a turbulent stomach and that includes feeding him food with little fat. Fat is good for your pet’s health but it requires a lot of work to break it down compared to proteins. Thus, if there is too much fat in her diet, he will start launching tsunamis. For a pet owner, having a sickly pet can be very distressful. This medical condition results when your pet’s pancreas is inflamed. The pancreas is an important organ as it helps your body break down food. If it is irritated, your pet’s digestive system might misfire. If that happens, your pet will not be able to digest fats. One of the symptoms is vomiting and loss of appetite. There are other symptoms such as lethargy, fever, diarrhea, and stomach pains. There isn’t a straightforward answer as to why your pet might develop pancreatitis; however, there are breeds that are much more vulnerable to this condition. Schnauzers, seniors, and overweight pets are at a greater risk of getting pancreatitis. In most cases, this condition is not serious as long as it is managed properly. That said, not all cases are mildbecause a serious case of pancreatitis can lead to other complications. If your pet has pancreatitis, the best diet is low-fat dog foodbecause her pancreas will have time to rest and recover instead of breaking down fats. As a pet parent, you definitely enjoy feeding your dog. Holding out a treat and watch in gas his face come alive is an enjoyable experience. Unfortunately, too many treats or an incorrect quantity of dog food can cause your pet to put on weight at an alarming rate. If your pet is overweight, he will be vulnerable to a host of problems such as joint pain or even pancreatitis. 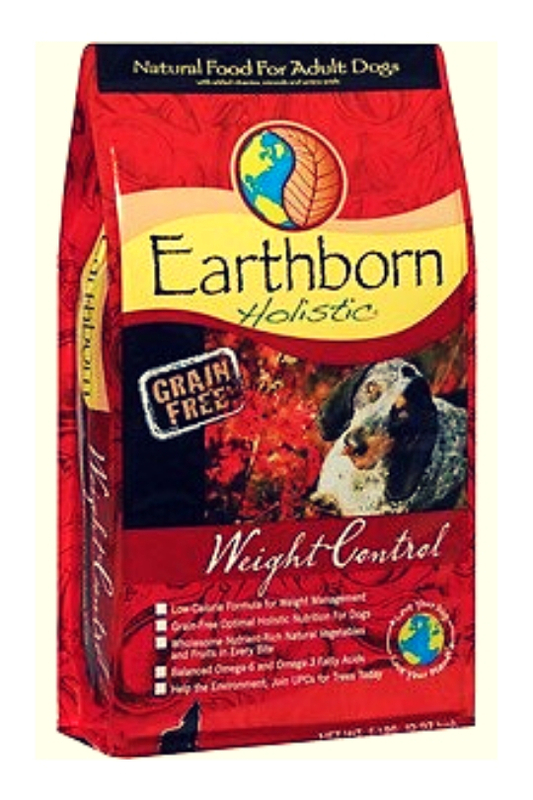 If your pet is not shedding weight as fast as you would like, try low-fat dog food. The food won’t make him lose weight, but it will prevent him from putting on additional weight. That, together with regular exercise, will help your pet manage his body weight. 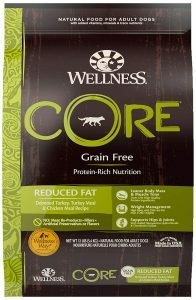 ​​Considered a popular brand of dog food, Wellness CORE was formulated with little-fat dogas one of the priorities. The label on its packaging reads 25 percent less fat content, which is much lower than its other popular recipe formulation. Little-fat dog has not compromised the quantity of other essential nutrients. Your pet will still get a good supply of protein from sources like chicken and turkey. Omega acids are also present in adequate amounts; thus, your pet will get the essential acids necessary for a healthy coat. 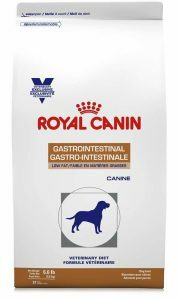 ​​If your pet has a sensitive stomach, ROYAL CANIN is the best food for him. Not only does it have little-fat dog, it the best option if your pet has a turbulent tummy and he keeps flooding your floor with stomach content. Other than low fat, ROYAL CANIN has low fiber content. Fiber is also known to cause problems for pets with a sensitive stomach. Among its ingredients, there are also carbs from high-quality sources. The best thing about this dog food is that you don’t need to be worried about her not getting enough nutrients. Even though fat and fiber are at their lowest levels, the other nutrients are in good supply. 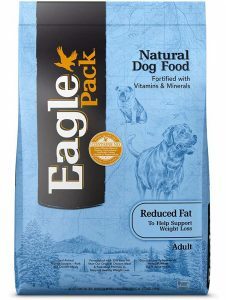 ​Eagle Pack is one of the best dog food brands because the quality of their protein content is unmatched. 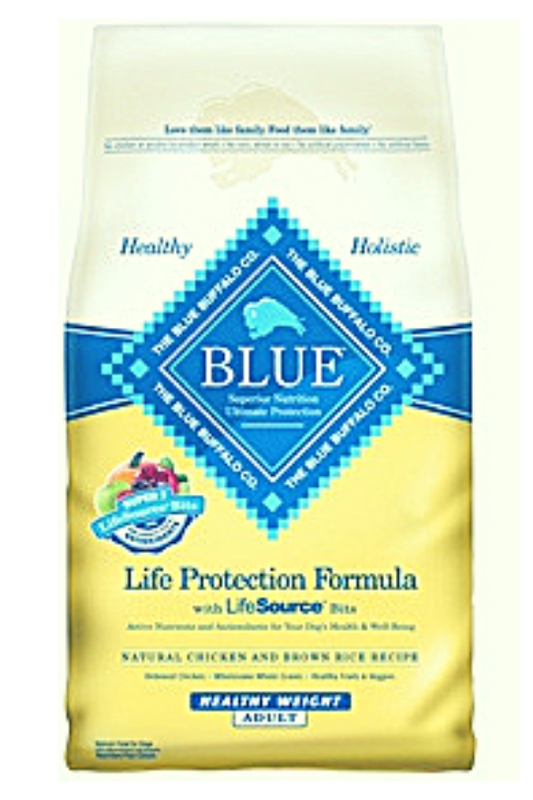 While this dog food is low in fat, the protein content is sourced from chicken, pork, and fish. In fact, this formulation has 35% less fat when compared to the original formulation, which makes it worth feeding to your pet. It’s also a low grain product and this makes Eagle Pack an ideal choice for pets that suffer from allergic reactions because of some of the foods they consume. Once you start feeding Eagle Pack to your pet, you will notice some great changes in form and frequency of their bowel movement. If your pet has a sensitive stomach, you will notice less gastrointestinal irritation. Also, your pet will grow healthier because her food supply has all the essential nutrients and he won’t feel the craving to eat a lot more than is necessary. ​​This brand is growing in popularity, thanks to its low level offat. 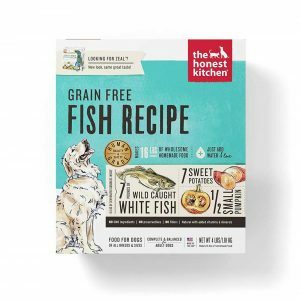 The Honest Kitchen Zeal is freeze-dried making it ideal for pets that are looking to lower their body fat content. The reasons this brand stands out is its fat to protein ratio. You will be pleased to know that it has just 8.5% fat content and a whopping 35% protein content. Besides that, its key ingredient is white fish, so even if fat levels are low, your pet still gets a lot of omega acids necessary to form a healthy coat. That’s not all, the ingredient list includes vegetables and a good supply of healthy fruit. Vegetables include parsley and cabbage, nutrients that your pet needs to grow healthily. 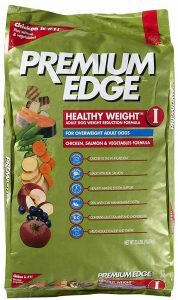 ​​Premium Edge is formulated to provide your pet with tons of proteins and a small supply of fat. Although it’s meant for overweight puppies, you adult pet can also enjoy its goodness. If your pet has pancreatitis or a sensitive stomach, be sure to try Premium Edge, as it’s among the most nutritious pet foods on the market. Whole chicken is the chief ingredient and that places its overall protein content at 25% while there is just 8% fat. Other ingredients include carbs from sources such as barley and brown rice, although, in some cases, you will find Premium Edgebrands with potatoes and rice. The list of ingredients does not end there because there is also a sizeable amount of peas, kelp, carrots, blueberries, apples, tomatoes, and spinach. Your pet will have a sufficient amount of fiber, which is good for her health. 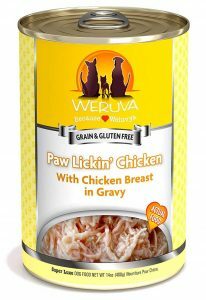 ​​Weruva Dog Food is a canned pet food brand that is also low fat. If your pet has diarrhea, this is the best food to help get his health back on track. While it is not ideal to feed canned food to your pet because it has a lot of water, it is the best option for pets that have digestive issues. Since canned food has a lot of water, fat content is very low. Weruva Dog Food has just 1.4% fat, while the rest of it is mainly protein, 10%, and water, 85%. Its protein content is animal-based and comes from chicken. Unfortunately, it is not meant to be used as a long-term source of nourishment for your pet because its nutritional content does not include other essential nutrients such as vegetables and fruit. It's best suited to help your pet recover quickly from a digestive issue. 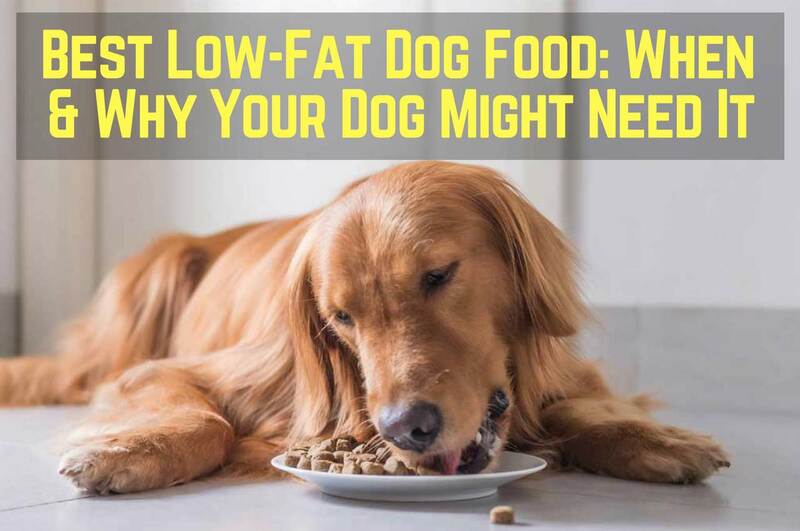 ​​When Shouldn’t You Feed Low-Fat Food to Your Dog? Ever heard of the saying, if itisn’t broken don’t fix it? This saying is the truth when it comes to your pet’s dietary fat content. Unless it is confirmed that your pet has a medical issue or your vet has specifically instructed you to place him on a low-fat diet, there is no point in changing his diet. Don’t fall into the trap of believing myths about dietary fat in human food and obesity. Fat, when consumed within acceptable limits, is good for your pet’s health, so you should not mess about with his diet because your pet is not vying for miss world. He certainly won’t score any points for looking like a scarecrow. In the right amounts, fat not only provides him with energy, it also helps your pet grow a healthy coat. A dog with a healthy amount of body fat has a smooth and radiant coat. If you limit the amount of healthy fat, his coat will turn flaky and dark. 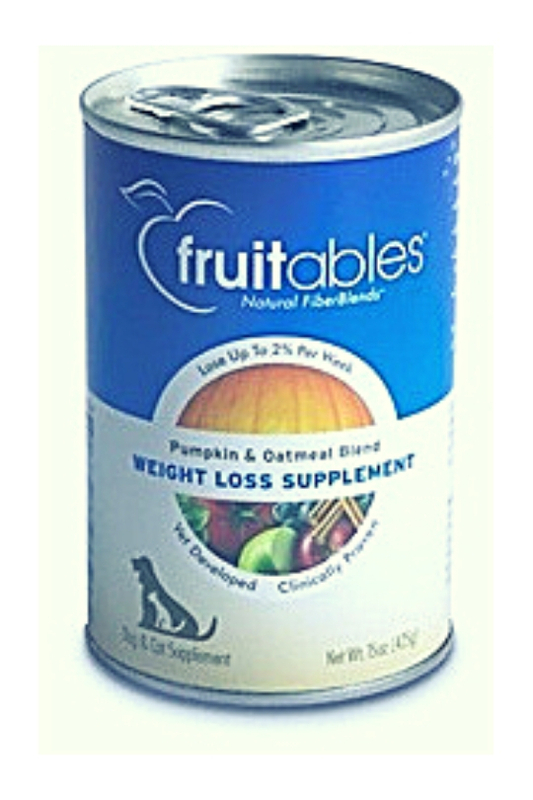 low-fat dog food is an ideal choice for pets with a sensitive stomach, pancreatitis, or those that are overweight. Although fat content is low, these pet foods don’t compromise the quantity and quality of other essential nutrients. Low-fat dog food is best suited to help your pet manage his health condition or body weight. If you feel your pet needs low-fat dog food, the list we have provided has some of the best brands. Find one that works for your pet and help nudge him back to good health! 5 ​​When Shouldn’t You Feed Low-Fat Food to Your Dog?